Jennifer Fuss Doesn’t Like Fate - It’s the Aspects! Oh dear, so many new things! Compounded by the fact that I took a little break and this review covers three weeks. I’m in a rush, so no pictures, sorry! I may add those later. The Bakers’ open letter about PbtA games, bad tropes, a directory of game mechanisms, the 200 Word Challenge on reddit, the GauntletCon schedule, updates to Brie Sheldon’s Script Change Tool and Shane Liebling’s multiuser online dice roller, a look at aweseome action vs tangible obstacles in freeform indie games and OSR, a (completed) Mouse Guard read-along, character profile menus for Untold characters, and Jennifer Fuss about her dislike of Fate aspects. And then there’s the games! News@11 and Someone Has Died are both improvisational card-based party games, the Bundle of Holding is full of delicious apocalypses, Itras By’s Menagerie supplement book is out, Vincent Baker has a new romantic Arthurian game, there’s a new Fate World of Adventure about a nonviolent world of storytellers, Anne Kreider released a sad robot LARP about wiped memories. And there’s also a whole bunch of free games! Todd Zircher’s The Trouble with Rose, two dog LARPS (yes, LARPs you can play with your dog) by Caitlin Belle and Oli Jefferey, Grant Howitt’s new one-page RPG about 1990s hackers, a bunch of newly translated italian storygames, Troublemakers, about children on an adventure (I’m sure they have bikes and a clubhouse), and no less than five Lasers & Feelings hacks. Prompted by discussions at Gen Con, apparently, Meg and Vincent Baker posted an open letter about what “Powered by the Apocalypse” actually is. I must admit I’m not entirely clear on what the bottom line is exactly (and what’s different to what people are already using the term for), but I have a vague feeling it at least indirectly affects my blogging about PbTA here and may be of interest in general. (Honestly, I don’t quite know what to do differently or if I’m doing it „right“ when talking about games that say they are Powered by the Apocalypse.) Rob Donoghue has a few thoughts on his G+ that sparked some more discussion as well. Also of interest, if you didn’t know about it yet, is that Vincent posted the letter at his directory of games Powered by the Apocalypse, which is a useful resource in and of itself. Check it out. +Michael Wenman apparently started his 52-part blog series discussing different game mechanisms over 8 years ago, but I’d never heard of it before. Recently he started to index them all for better organization, and this was how I found out about them (he’s about halfway done by now). As I understand, he’s collected and analyzed common mechanisms developed by other designers (Fate Points, Life Paths, Otherkind Dice) as well as his own ideas, such as his proposal of how to handle supernatural powers or his discussion of hit points vs injuries. +David Schirduan has moved the community for the 200 Word RPG design challenge over from G+ to Reddit. As an added bonus, there are now semi-weekly challenges to participate in. The first one, „create a game using dominoes“ is already finished and the winning entry, DomiNo Regrets has an interesting character generation mechanisms based on the pips on either side of a domino. Gauntlet Con, the Gauntlet’s online hangout con running from October 20th to 22nd, has a schedule website where you can view what games people are running and sign up to play. Lots of great games and GMs - there’s even Monsterhearts and Drew Askew rounds run by designer Avery Alder herself, and a round of Alas for the Awful Sea run by codedesigner Hayley Gordon. Many are already full ,though, but you can always ask to be put on the waitlist! Also take a look at some of the lonelier ones that deserve better: Rockerboys & Vending Machines sounded super fun on the SASGeek podcast, and is only 25% full, for example (you can sort by how full each session is in the „All events info“ view). Brie Sheldon’s Script Change Tool has existed for a while and I always intended to take a closer look. Now that they’ve updated it a few weeks ago, I have and definitely recommend you do so as well! It’s like an expanded X-Card with three cards: Rewind, Fast Forward, and Pause. Find out more and print your own cards at Brie’s blog. Shane Lieblings „Roll for Your Party“ online dice roller has a pretty substantial update! Among other things, it now incorporates Brie Sheldon’s Script Change Tool, as mentioned above. Michael Prescott muses about the role of resolution mechanics and play styles. In his „awesome action“ vs „tangible obstacles“ article he discusses the difference between the flexible difficulty settings in games like Dungeon World and Blades in the Dark compared to the set obstacle difficulties in old-school Dungeons & Dragons. I’ve been keeping an eye on Kevin H.’s „Let’s Read Mouse Guard“ thread on RPGGeek for a while, and now he is done with the book - take a look at the interesting discussions that the project inspired, especially if you’re not quite sure about Mouse Guard yet. His game Untold is not even out yet and designer John Fiore is already tinkering with advanced rules: „Character profile menus“ are a little like playbooks with a few premade „advanced moves“ (or rather familiars, weapons, tools, and abilities) you can receive in later episodes. Jennifer Fuss has a little a rant about why she doesn’t like Fate that I found pretty interesting. The gist is that she hates aspects. I agree with her. I agree that they are hard to come to come up with from thin air, especially if they are going to be as clever, witty, and double-edged as the ones in game examples, and it’s hard to have balanced aspects between all players in the group. There are a few other games that also work like this (most prominently for me, my beloved Freeform Universal, but also Risus). That’s why I find it so important that games like these should have lists of options and suggestions to choose from. Like Jennifer, I really dislike having to come up with something from nothing, and I firmly believe in the „creativity comes from boundaries“ maxim. I love that many, if not most, PbtA games have short lists for most everything on the playbook (and that they offer playbooks at all). Names, faces, eyes, yes please, give me something to pick from! I feel that Fate World of Adventures should have many more lists like these. The upcoming Heavy Metal Thunder Mouse from Shoreless Skies is going to be a Fate game with playbooks and I’m really looking forward to that. News@11, on Kickstarter right now, is a storytelling party game in a box by Jonathan Gilmour (of the hit board game Dead of Winter) et al. where you play news anchors reporting absurd news stories prompted by customizable cue cards. You can take a look at what people thought about earlier versions of the game on its BGG page. Someone Has Died by the all-women team of Adi Slepack, Ellie Black, and Liz Roche is „a silly game about serious business“. Like News@11, it’s also a card-based party game where you play weird people (robot with feelings?) at a will opening, arguing for a share of the deceased’s fortune. Your character is defined by a handful of silly cards (role, relationship to the deceased, backstory). The legal setting and the card prompts kind of remind me of Jason Morningstar’s Ghost Court! The current Bundle of Holding „Apocalypse Engine +2“ is really a giant cornucopia of popular games! The lower tier (13 Dollars) gets you the new Apocalypse World 2E, Action Movie World: First Blood, Spirit of 77, and the shared-consciousness cyberpunk game Headspace. The second tier (24 Dollars) adds the Russian airwomen of Night Witches, teenage superheroes in Masks: A New Generation, „my little dragons“ in Epyllion: A Dragon Epic, space opera in Uncharted Worlds, and the Action Movie World supplement „Deleted Scenes“. Itras By: The Menagerie, The Iras By supplement of many diverse creators is out! I’ve paged through my copy (thanks Ole Peder and Carsten!) and it looks and reads lovely. I’m certainly going to write a few more words about it in the not so far future. D. Vincent Baker has a Patreon, did you know? I didn’t, or had forgotten. Anyway, he has a new game based on his own and Meguey’s Firebrands and The King is Dead: „In Dreaming Avalon“, which is a party game focusing on romance, Arthurian knights, and Shakespearean faeries. If you’re already a patron, you can read it right away here, or become one! Evil Hat just published their latest World of Adventure setting supplement for Fate (or rather Fate Accelerated) this week! 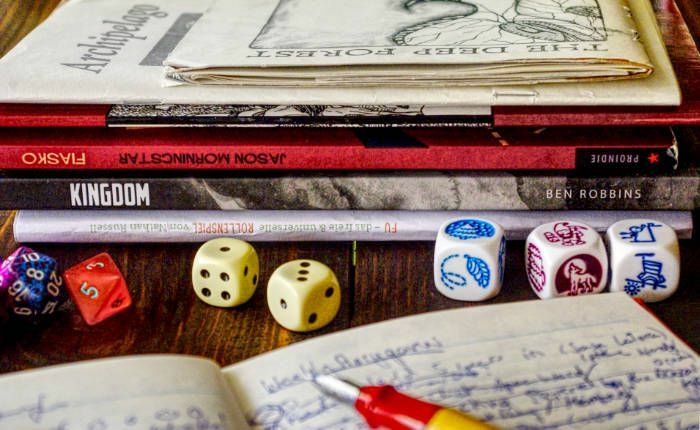 In So the Story Goes (PWYW at DTRPG), players are a group of storytellers, musicians, and artists in a world where they are relied upon as keepers and history and all its lessons. Except the previous generation of Storytellers has been completely wiped out by a tyrant, and you are the valiant newbies trying to recover all the lost wisdom that died with the old storytellers! The PDF contains a starter scenario, sample PCs and locations and additional rules that focus on social interaction over violence. Anna Kreider just released her latest LARP „Factory Reset“ on DTRPG. Players are androids taken back to the factory to get their regular maintenance, which ominously includes a memory wipe. Todd Zircher’s The Trouble with Rose is now on DTRPG. Round-table GM-less storytelling with dominoes! Of note: A few people on the Lone Wolf RPG community of solo RPGers are already discussing it from an animal rights and consent perspective. Also, Oli Jeffery felt inspired to make his own solo LARP playable with a dog, Animal Companion, where you and your dog are a ranger and their animal companion escaping from orcs (other people and animals in forest). Bonus: Play with a small child that’s a halfling rogue. Find out more on this reddit thread! (Direct link to imgur pic of the game). Kind soul „jimmayr“ typed up the whole thing into a digital version (in four color variants, no less) and posted it on the reddit thread, too (direct link to Google Drive). And then there’s also this Google Doc file of it from Grant himself (I suppose so it’s easier to, you know, hack). Roberto Grassi (I mentioned him last time) has translated three more of his story games into English: Path, The Secret, and the third, The Wise Man, is actually not by him, but by Ivan Lania. Take a look at his announcement on G+ to find the links and some more info. Anastasia Gasteva and +Aleksandr Ermakov made “The City of Ys Returns”, hack of Lasers & Feelings about Breton myths. Tim & Kristin Devine of https://www.diceupgames.com have two new Lasers & Feelings hacks, and both of them even come with character sheets! (H/t to John Harper and Bruno Bord on Twitter). Wits & Chivalry is one for fans of Monty Python & the Holy Grail - you play as humorous knights of the round table. What’s special: There are random adventure tables for each of the three acts, and knights play in two separate groups that only meet up in act two. In fact, each player has a second role as a companion to one of the knights currently in the scene. Also, speaking in silly accents gains you an extra d6 on your roll. Truth & Daring is another one of the many games in the „kids on bikes“ genre that’s so hot right now thanks to Stranger Things. It also has instructions and hints for GMing a three act story. This time, instead of a spaceship, you have a club house (of course!) complete with a club motto and an additional challenge the club is facing beside the main adventure (e.g. local gamestore going out of business).